Your concrete basement isn't impervious to rain and other water, unfortunately. While every basement is made to resist moisture damage, sometimes the moisture barrier simply cannot withstand the test of time or the elements. There are plenty of factors that play into the moisture barrier of your home deteriorating, none of which are really under your control as the home owner. Whether the contractors who built your home and waterproofed your basement made a mistake, or the amount of rain, freezing and thawing that have occurred around your home was simply to much for the barrier doesn't matter too much. People all over the world experience leaks or cracks in their concrete basement, and you're not alone. Is your concrete basement wall leaking? If you do see signs of water seepage or leakage in your basement such as dampness, drips, trickles or pools of water, it's definitely time to repair and waterproof your concrete basement. Leaks and drips can seem like temporary problems, especially when they only occur during rain or storms, but you can rest assured that a tiny leak turns into a big leak over time, and in the interim the water that penetrated into your home is causing serious damage. Water doesn't only cause damage to the structural and cosmetic components of your home, it's also involved in decreasing the quality of your air and threatening your health. If you're experiencing foundation flooding or a leak in your concrete basement, give is a call today! Why should I worry about water damage? Water can have far reaching effects on your home. In addition to soaking anything you have stored in your basement and destroying the storage space, water can change the quality of the air in your house. Homes with standing water or damp walls are more likely to encourage the growth of mildew, mold, and fungus spores. Particles of these growths get into the air and subsequently into your respiratory tract, which can cause coughing, sneezing, or even a respiratory infection. They also seriously aggravate your throat, and can cause allergic reactions and augment the symptoms of asthma. 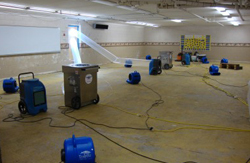 Water damage is terrible for the structural soundness of your home, as well. The increased humidity is absorbed by the building materials of your home, causing drywall to crumble and break, wood to swell and warp, ceiling tiles to droop and break, and even rotting in structural supports. With all the expensive and dangerous effects of water leaking into your home, it's important that you take damage to your concrete basement seriously. Fortunately, preventing these types of problems is easy. 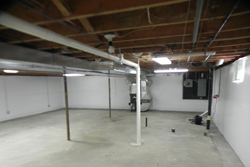 repair and waterproofing of your concrete basement. Your foundation leaks because of a damaged or worn out sealant protecting your concrete basement. The groundwater in the dirt around your home is constantly applying pressure to the sealant that protects your basement. Over time, if too much pressure is constantly applied, your sealant may be damaged resulting in dripping, leaking or pooling of water in your basement. There are plenty of elements that increase the amount of water in your soil and consequently the amount of pressure it exerts on your basement walls. Rain and snow are probably pretty obvious; a less obvious factor is a shady yard that doesn't dry out very quickly. Also, if your yard slopes towards your home, precipitation runoff may flow directly towards your house further increasing pressure on your moisture barrier. Regardless of why your moisture barrier is leaking or failing, we're glad to help you fix the problem and get back to having a dry, warm and comfortable basement.